Standard Vanguard Phase 2 "Spacemaster"
This old ad was taken from an Australian newspaper back some time in the 1950s, and features the Standard Vanguard Spacemaster. The Spacemaster was not a model name used by Standard-Triumph back in the UK, so this must be a local Australian version. The car shown is the notchback Phase II Vanguard, which replaced the curvier 'beetleback' styling of the Phase 1 with this, more conventional, 3-box styling. Personally, I preferred the look of the Phase 1. 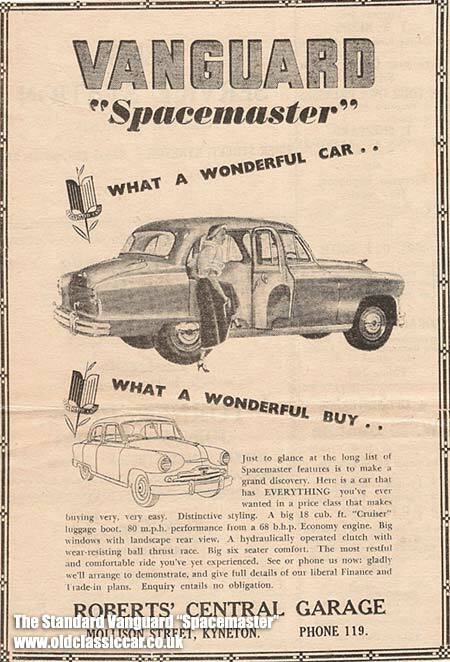 The copy in this 50s advertisement goes as follows ... "Just to glance at the long list of Spacemaster features is to make a grand discovery. Here is a car that has EVERYTHING you've ever wanted in a price class that makes buying very, very easy. Distinctive styling. A big 18 cub. ft. "Cruiser" luggage boot. 80mph performance from a 68bhp Economy engine. Big windows with landscape rear view. A hydraulically operated clutch with wear-resisting ball thrust race. Big six seater comfort. The most restful and comfortable ride you've yet experienced. See or phone us now: gladly we'll arrange to demonstrate, and give full details of our liberal Finance and Trade-in plans. Enquiry entails no obligation." The Standard dealer in question was Roberts' Central Garage, Mollison Street, Kyneton, Australia - I wonder if there is still a car dealership at this address?? (Added 22/05/06: contact from Australia - "In answer to your question, YES, there is a Toyota and GM Dealership in Mollison St Kyneton" - thanks Graeme/Pauline). The Phase 2 Vanguard was introduced by Standard Motor Cars of Coventry, England, in 1952, and featured a number of revisions over its earlier, beetleback, parents. Not least the styling, which fell more into line with current thinking and fashions, and the loss of the fully enclosed rear spats seen on the earlier cars. Estate cars were also available, as were the now-rare vans and pickups. Power came from the familiar Standard 4 cylinder engine of 2088cc. The acceleration was fairly average for its day, taking somewhere over 20 seconds to hit the magic 60mph mark. For those seeking even more pedestrian progress, along with a soundtrack that wouldn't be out of place in the middle of a field, was the Phase 2 Vanguard diesel, still 4 cylinders but a fraction larger in capacity. Top speed wouldn't trouble any motorway speed cameras today, but to its credit, up to 50mpg was available to the careful motorist, not bad going for such a capacious (and heavy) car. Sales, just like the car, were sluggish, and production only lasted for the 1954 - 1955 seasons. Other Standard information on oldclassiccar includes the spare parts page for the Phase 2 Vanguard, or alternatively you can see an overview of all the current Standard adverts right here.